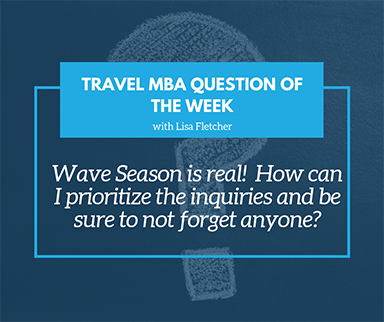 “Wave” season is the term used to describe the first few months of the calendar when you get the big wave of inquiries coming in for travel in the new year. If you aren’t careful, if can also leave you feeling like you’ve been crushed by a rogue wave at the beach! Triage like a MASH unit – Do you remember the old sitcom M.A.S.H.? It was about a mobile army surgical hospital in the Korean War and they used to have waves of injured US soldiers coming in all at once. They would triage them based on urgency. You can do the same. Put the closest departure dates and easy itineraries first and work from there. Set reasonable expectations – It’s much better to tell someone that you should have a quote to them in a week and deliver it within 72 hours than the other way around. Set reasonable response time expectations with your clients and, if you realize that you underestimated the time needed, be sure to reach out and let them know so they aren’t wondering what’s up! When in doubt, you can ask the client when they would feel comfortable having a quote from you…you might be surprised that they are fine waiting a week or more! Use Technology – Be sure to use your Google Calendar, or Travel Joy or ClientBase or whatever platform you choose to keep yourself organized. Enter reminder dates that will prompt you to follow up and keep you on track. Ask for Help – If you feel like you are totally in over your head, reach out to us for help. We are here to help you navigate the first 6 months to 1 year of your business and can certainly help you streamline procedures and suggest ways to organize your tasks. So, Wave Season should actually be celebrated! It means that everything we have been teaching you is working! Take things one step at a time and remember GTN has your back.